Volkron CheckBook is a ledger to keep track of your bank accounts and manage your finances efficiently. 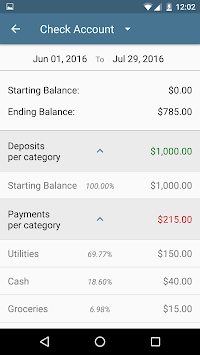 Keep track of all your payments and deposits, control your expenses, and manage your budget. 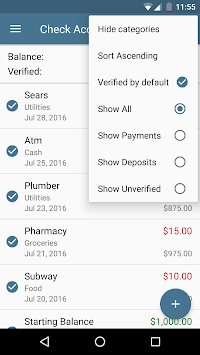 A digital checkbook replacement for the classical paper checkbook. It has an elegant and intuitive design, and supports many currencies and number formats. 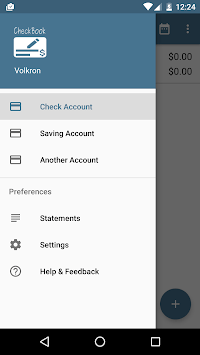 This checkbook app has the most user friendly interface. * Many currencies and number formats supported. * Insert automatically the decimal separator. - All the accounts that you need. - All the information needed for each transaction. - Auto-complete for categories and names, or select from a list. - Review all your deposits and payments by category. - Starting and ending balance information. - Select period by any custom date range. - Search transactions by name, category, notes, codes (checks), and amount. - Filter transactions by payments, deposits, verified, or any custom date range. - Edit the verified/unverified status of each transaction.